Many people grew up watching Annie whether it was on stage or the Carol Burnett movie from 1982. It has received a modern twist in the latest version of the classic musical. 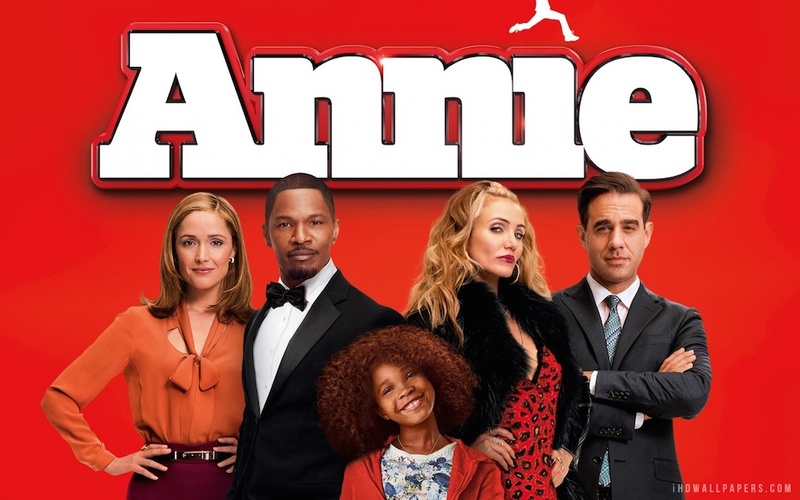 Annie (Wallis) is a foster girl from Harlem living with a group of other girls under the pseudo-strict guide of Miss Hannigan (Diaz). In this version, Miss Hannigan is a washed up pop singer who used to be a member of the ‘90s group C&C Music Factory. Annie is a go-getter always running around the streets of New York City making friends along the way. Every Friday she sits outside an Italian restaurant hoping that one day her parents will return. When she was little, they left her with a note stating that one day they will be back. One afternoon as she is out trying to track down her birth records, she is almost hit by a van but is saved by millionaire Will Stacks (Foxx). Stacks owns his own cell phone company and is now running for mayor. A video of the incident turns into a viral hit and Stacks is informed from his advisor Guy (Cannavale) that adopting Annie may be the game changer he needs to get ahead in the polls. The two of them couldn’t be any more different but they form a bond and friendship that extends beyond the arrangement of his political priorities. Jay Z, Will Smith, and Jada Pinkett Smith produce the film and I applaud the idea of taking a different spin by trying to modernize Annie. Why bother remaking something if you don’t try something new. The big problem with the film comes in its execution at the hands of director Will Gluck. Some of the lyrics have been changed to fit the current time period and the music has been given a hip/hop vibe to it, especially when Jamie Foxx starts singing. On top of it all, it is auto-tuned like crazy. The musical numbers try to be fun and lively but are messy as the instrumentals purposefully overpower the terrible singing that accompanies it. Some numbers like “Easy Street” are quite painful to listen to, and I couldn’t understand some of the lyrics. I honestly don’t think that any of the actors had to go through musical auditions before getting cast. The titular role was originally intended for Willow Smith but Academy Award nominee Quvenzhané Wallis (Beasts of the Southern Wild) ended up playing the spunky orphan. 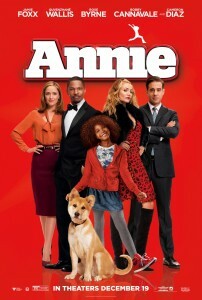 She has the strong confidence and personality to bring to Annie, and in turn, is one of the few highlights of the movie. Her number “I Think I’m Going to Like It Here” with Rose Byrne (Neighbors, Bridesmaids) and Stephanie Kurtzuba (The Wolf of Wall Street) is one of the few musical numbers that had some personality to it. Cameron Diaz does not fare so well as Miss Hannigan. Carol Burnett reigns as the ultimate Miss Hannigan. Even though you can’t really top her, Diaz doesn’t even come close to nailing the idea of this character. She tries way too hard to be “scary” and her yelling just comes off as awkward. Normally Diaz can be strong with the comedic side of any character, but she completely misses the mark with any of the comedy that comes with the character. This is the second movie musical for Jamie Foxx following Dreamgirls. I still don’t understand why they changed his character’s name from Daddy Warbucks to Will Stacks. They’ve also made him a germaphobe. Foxx is pretty much playing what you expect from him. Part of this modernization includes very cynical views about politics that play a big factor in the movie. It seems so wrong to have this as a focal point for a movie made for kids. The idea of using Annie as a game changer to enhance the Will Stacks’ campaign feels inappropriate and would naturally go way over a kid’s head. It would be one thing if that was the only instance of this plot device in the story, but it occurs later on when Guy and Hannigan decide to hire two people (Thoms and Missick) to pose as Annie’s parents. They know it will be the thing to help Stacks win his campaign, but they do all of this without his knowledge. Again, I ask the question, why are we making this children’s movie about the dirty sides of politics? We have seen a couple of remakes of Annie, but this has to be the most painful. The version we all know and love is basically used as a framework with many changes made to fit into this new interpretation. There are a few decent performances, but the film is void of any heart that should come with it. There were numerous children in the theater when I saw it, and I couldn’t really tell if any of them were enjoying it.